Charles Dicken’s A Christmas Carol is arguably the most well-known Christmas story of all-time. Ebenezer Scrooge’s transformation from that of a stingy and ungrateful old man, to that of a generous and thoughtful family man has become a timeless piece of English literature. But what about the other characters? Namely, what ends up happening to the members of the impoverished Cratchit family to which Scrooge is attached? Do they really all live happily ever after? Set twenty years after the events of A Christmas Carol The Astonishing Times of Timothy Cratchit with book by Allan Knee and score by Andre Catrini, the story of a now 19-year-old Timothy Cratchit, a coming of age story which focuses on the affable young crippled boy formerly known as Tiny Tim. Alas, the Tiny Tim of olden days exists no more. Thanks to medical advancement in the mid-1800’s, young Tim underwent a surgery which not only cured him of his ailment, but gave him a new heightened ability referred to as “a dancing leg.” This newly autonomous dancing leg is Timothy’s calling card and—whether he accepts it or not—the leg which was once a burden is now the precious asset upon which this grand adventure is based. The Astonishing Times of Timothy Cratchit is massively ambitious. As if imagining a sequel for one of Dickens’ most famous fictional characters wasn’t enough, Knee and Catrini scale things to an even higher level by tying in the fictional accounts of A Christmas Carol with the real-life autobiographical Memoirs of Joseph Grimaldi, written first hand by the famous English clown and then later rewritten by Charles Dickens. It is a heroic effort which attempts to bridge the gap between two of Dicken’s most famous works, even if there isn’t much correlation between the two to begin with. 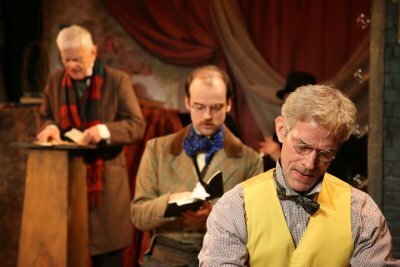 Unfortunately, heroics don’t always guarantee success, and The Astonishing Times of Timothy Cratchit suffers from an overstuffed script which forcefully pieces together two completely different worlds. Considering that both of Dickens’ works are set in time periods which overlap, the story is plausible. However, the lasting impression is that the whole evening feels like two separate plays which intersect halfway. The characters from Timothy’s world and Grimaldi’s world have nothing in common except for Timothy, and this disparity leads to a fractured story which lacks empathy and limits the character development of everyone except for Timothy. In reference to the cast, this is a production which does not lack in talent. 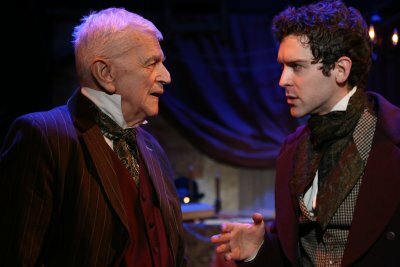 As Timothy Cratchit, Nathan Gardner provides a heartfelt and inspiring performance which is a testament to the actor’s sustainability: The Astonishing Times of Timothy Cratchit runs nearly two and a half hours, and features over 20 musical numbers. Save for a few missed moments throughout, Gardner—in his NYC debut—handles the undertaking of this massive role with panache and, in doing so, indicates a bright future. The supporting cast is a true highlight of the evening as all of the ensemble members are asked to perform multiple roles in both stories. In each scene, a bevy of new characters are brought to life, and the supporting cast members employ different postures, dialects or comedic techniques which imply strong and varying skill sets from the best of them. Hanley Smith, who plays Timothy’s love interest Lucy as well as the seductive and dominant Aria, brings a fragile honesty to the more feminine character of Lucy while providing a comedic and aggressive turn as her Russian counterpart. Andy Ingalls, a strong character actor who plays about five characters, strengthens any scene he is in and shows a deep appreciation for, and embodiment of, physical comedy. Standing out from the rest of the cast is D.C. Anderson’s portrayal of Grimaldi. Until the arrival of this character, the story feels drawn out and lacks focus. He is a delight to watch on the stage, and his presence brings to the production a mysticism and wonderment which is scarcely felt otherwise. His portrayal of Grimaldi brings to the character a childlike enthusiasm for life with wisdom gained from past experience. The score by Catrini is of monumental size. Though most of the songs in the first act seem to bob between styles in the hopes of finding one that sticks, the second act is full of notable tunes—namely “As I Move Along,” the Act Two opener, and “The Performance,” the culmination of Timothy’s adventure—which send the show off on a positive note. That being said, over 20 songs are written into the show, and not many of them contribute anything to the advancement of the plot. 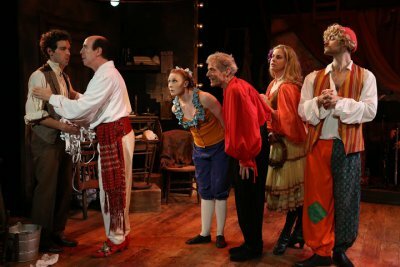 Director Thomas Coté—who is also the Artistic Director of the Workshop Theater—has brought to life a colorful world of Dickensian characters backed by strong individual performances. Despite any flaws in the script, the production is thoughtfully designed and directed with style. Craig Napoiello’s scenic design is vivid and authentic, decorated with set pieces which could have been torn straight from the 19th Century. The lighting design (Diane Duecker) and costume design (Kimberley Windbiel) complement the set beautifully, so that when the rays of warm and rich colors bask down on the actors, who are garbed in beautiful and ornate pieces of Victorian outerwear, the final portrait is in likeness of a historic photograph from Dickens’ own lifetime. Though The Astonishing Times of Timothy Cratchit isn’t without its flaws, this is a show which has immense promise. Strategic refinement of the storytelling, a good hard look at which songs matter the most, shaving a half hour off the running time would do wonders for this sweet and original coming of age tale.